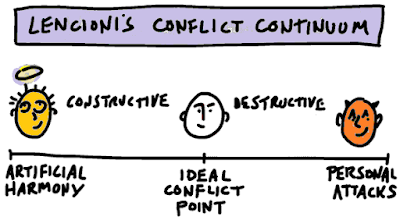 In the example above (hand-drawn replica from the book), Lencioni illustrates the need for productive conflict in organizations and the fact that conflict is not always constructive. On the one hand (left), many companies exhibit “artificial harmony”. On the right side, people can be downright nasty, constantly at each other’s’ throats.